Iran’s Foreign Minister Mohammad Javad Zarif has assailed the European Union over the failure to establish a financial link vital for Tehran’s troubled economy. At the end of January, after four months of negotiations, the European Union launched a Special Purpose Vehicle for non-dollar trade. The arrangement for Iranian oil and other commodities and goods bypassed comprehensive US sanctions imposed in November, including on the Islamic Republic’s energy and financial sectors. However, the SPV is limited, covering only a targeted set of products in the first instance. Iranian officials complained about “humiliating conditions”, such as European criticism of Iran’s missile research and developments and its activities — including alleged support of bomb and assassination plots — in Europe and the Middle East. The Supreme Leader’s office has said that the prospect of links with Europe is over, but the Rouhani Government and Foreign Ministry have persisted. On Sunday, Zarif complained at the Tehran ceremony for the launch of the Ministry’s Economic Diplomacy website. He said the Europeans n no longer have any excuse to delay the initiation of the SPV. The Foreign Minister said the “preliminary meassure” of the January launch was inadequate. “[They] should not believe that the Islamic Republic will [continue to wait] for them,” he cautioned. He accused European banks of following the US in refusing to accept aid offered by Iranians abroad for recovery efforts after destructive floods across the Islamic Republic. 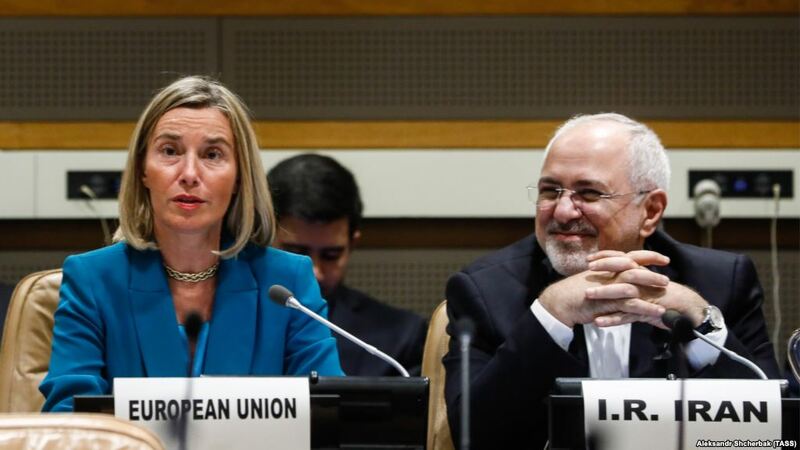 Zarif followed up on Monday by chiding the Europeans that Iran can pursue uranium enrichment under the 2015 nuclear agreement between Tehran and the 5+1 Powers (US, UK, France, China, Russia, and Germany). The tweet was later deleted from Araud’s account. Iranian Deputy Foreign Minister Abbas Araqchi said Araud’s comments were “a major violation of the object and purpose of the JCPOA” and required “immediate clarification by Paris, or we act accordingly”. The Foreign Ministry also protested to the incoming French ambassador in Tehran. Under the 2015 agreement, Iran can only enrich uranium to 3.67%. Tehran ceased production and shipped out stocks of 20% uranium, which potentially can be further enriched to more than 90% for military-grade nuclear weapons. The exchange follows Iranian declarations that they will pursue research and development of uranium centrifuges, steps which the Europeans consider are limited by the deal. Last Tuesday President Hassan Rouhani said Iran will develop highly-advanced centrifuges, in the wake of the US designation of the Revolutionary Guards as a “foreign terrorist organization”.